The new Xtreme N Storage Router (DIR-685) makes networking easier by combining the superior features of a wireless N router, a built-in Network Attached Storage (NAS) and a digital photo frame. D-Link is proud to present the new Xtreme N™ Storage Router (DIR-685). 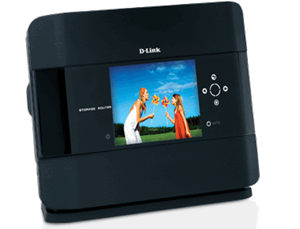 By combining the superior features of a wireless N router, a built-in Network Attached Storage (NAS), digital photo frame, and D-Link Green power saving features the DIR-685 creates the ultimate user experience while conserving energy. Experience faster speed and longer range in your home or office network with the latest 802.11n 2.4GHz wireless technology*. By adding a 2.5" SATA Hard Drive, the DIR-685 allows you to share storage over your network and access files over the Internet with the built-in FTP server. Featuring a built-in UPnP® AV server, streaming network stored videos through a compatible media player (including PlayStation® 3 and Xbox 360®) onto your television has never been easier thanks to the DIR-685. The upright design shows off the attractive view of the 1.6 million color 3.2" LCD screen with sleek touch-sensitive buttons that provide a modern feel to allow easy control of device functions and digital display of photographs. Easily access and share your photographs from popular photo sharing sites through FrameChannel™. With an integrated 802.11n high-speed band and a 2.4GHz signal, you can experience full wireless coverage throughout your network. Experience faster speed and longer range with powerful internal MIMO antennas. The DIR-685 has the ability to hold a compact 2.5" hard drive and includes a built-in NAS, which allows you to safely store files on your home network. A built-in FTP server is also included to allow you convenient access to storage wherever Internet is available. The DIR-685 includes the latest BitTorrent™ software support so you can access and store digital media directly from the Internet without the need for a dedicated PC to be turned on or connected. A built-in Universal Plug and Play (UPnP®) AV server allows you to easily stream video files stored on your network through a compatible media player onto your television. You can even stream files from your Xbox 360® and PlayStation3® gaming system. Share your latest photos with family and friends using FrameChannel®, Flickr™, Picasa®, Facebook®, and other popular photo sharing sites using your FrameChannel® account. You can also use the DIR-685 to subscribe to your favorite RSS feeds. Get the latest news, stock updates, sports scores, clock, calendar, weather conditions, and more directly on your frame. With two USB 2.0 ports, you can connect a printer and an external storage device to share throughout your network. You can even share a multifunction printer. SharePort™ is Mac compatible. Includes Ethernet Gigabit ports for file transfer rates up to 10x faster than the standard 10/100 Ethernet ports. The downloadable Storage Router Widget™ makes uploading music, photos and file documents from a PC to your storage router easy and simple. The widget allows you to choose specific files from your PC and view the upload status to your router. Create a wireless network to share high-speed Internet access with computers, game consoles and media players. Safely store files, print and share photos through your home or office. During periods of no activity the LCD display automatically enters sleep mode to further reduce energy usage.